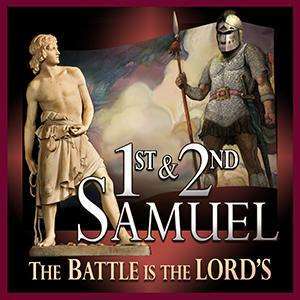 It is from the words of a young David in 1 Samuel 17:37, “The Lord who delivered me from the paw of the lion and from the paw of the bear, He will deliver me from the hand of this Philistine”, that we derive the central theme for this study of 1st and 2nd Samuel, THE BATTLE IS THE LORD’s. We all face overwhelming circumstances in our life and the only thing that can give us strength to overcome those horrific circumstances is a realization that it is not by our might or power, but by the power of the Holy Spirit. It is the only way that we can overcome and address the challenges that we have in life. Note: Classes in this series are arranged with the most recent class appearing first. To view all video Bible studies in the 1st and 2nd Samuel series, click here. In a collapsing world filled with violence and chaos comes a little known, sorrowful woman who humbles herself before God and trusts in Him for help. Listen to this lesson to hear the story of how one woman and the son who was the answer to her prayer changed the course of history for Israel. See how God is always in control and honors humility and faith. Find out how Samuel stood at the crossroads of one of his country’s darkest hours and set in motion their deliverance from the Philistines. Hear the striking comparisons between Samuel and Moses and how each was used by God for seemingly insurmountable tasks. Instead of succumbing to hopelessness in the face of all that is happening in our country today, turn to God for the answers that are always available. Get ready for a high-stakes adventure as God is at work preparing to deliver Israel from what seems like a hopeless situation in the time of Samuel. See that the people of the land were evil and disobedient, including the priests in the Tabernacle. Listen to this lesson to hear that one obscure, anguished woman trusts God and gives her son, Samuel, to the Lord. Change comes slowly as God is disciplining the people and teaching them lessons they must learn. Find out how the angelic conflict is involved when there is anti-Semitism. Understand that God is always in control and nothing is too hard for Him when people turn back to God and trust Him for deliverance. What this country needs are some good leaders to turn it around. Wrong! Listen to this lesson to see that what any country needs are people who turn to God and His Word for guidance. Hear about Israel under the judges which had reached a low ebb and had no respect for God or His Law. See how when a nation rejects objective truth it becomes subjective and each one only does what is right in his own eyes. Note the contrast between Samson and Samuel. Find out about a grandson of Moses who was a failure. Hear a story of decadence and immorality about a woman who was raped and murdered, leading to almost the complete destruction of one of the twelve tribes. Instead of longing for a leader to magically turn things around, put your trust in God and share the gospel with others. What does the ancient country of Israel in the time of Samuel have to do with us today? Listen to this lesson to see that just as Israel neglected to obey God’s commandments and began to act just like their pagan neighbors, so we slip into thinking that we have no need of God, also. Find out the purpose of the book of Samuel and why it is categorized with the prophecies. Understand the negative cycle the Israelites went through that culminated in divine discipline to bring them back to God. Learn about nine Biblical purposes of human government. As a believer, live your life in accordance with God’s Word so people around you will want to know what you have and you can witness to them. What can we learn from history to help us solve the enormous problems we face in our country today? Listen to this lesson to learn that only when a period of history is based on revelation from God can it be instructive. Follow a timeline of the history of the nation, Israel, and see that they cycled from periods of spiritual truth to disobedience to God where they deteriorated into hopelessness, economic downturn, and despair. Learn that when they turned back and walked in obedience to God they were blessed once more. So it is for us. When we let things spiral out of control through disregard for God’s Word, we need to turn back and walk in the Lord to have stability in our lives. If you’ve always thought of the Bible as an obscure, pious book filled with stories of great Biblical heroes, think again. Listen to this lesson to learn about a country dominated by earthy, flawed, and sinful men, much as we have in our country today. Follow a dark period in Israel’s history and learn about three very different men, Samuel, Saul, and David. Learn about a murderous king influenced by demonism. See that as the book begins, God is working behind the scene, preparing to deliver Israel by bringing change. As you approach the study of this book, ask yourself if you’re like many in those days, trying to be a covert believer rather than living in open obedience to God’s Word. Attention all history buffs! Get ready to begin a study of ancient history that addresses challenging events in a nation in chaos that would be right at home on our nightly news. Learn about Samuel who was a prophet, priest, and judge and why he cannot be the sole author of this book. Understand the difficulty of dating when the book was written and follow a timeline of the chronology of events that take place in it. Learn that this book was written for the Jews in Solomon’s generation as a warning to teach them the importance of obedience to God to bring prosperity, success, and victory over enemies. Accept that the message for today is that the people of our nation must either have a massive return to positive volition to God’s Word or we will feel the force of a repressive government.